Webster Luke Air Force Base campus director David Handrahan honored his former commanding officer with a holiday wreath placed at his headstone. 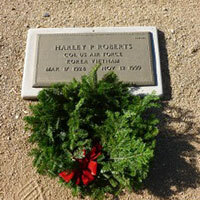 When professor Pam Unternaehrer told her HRMG 5000 Managing Human Resources class at Webster Luke Air Force Base that she was adding a project to their final exam for the Fall 2 term, the entire class jumped at the change, which turned out to be taking part in the 2017 Wreath Across America ceremony at the National Memorial Cemetery of Arizona. 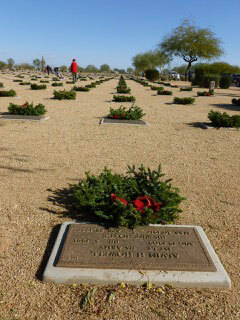 Each year, in mid-December, at national cemeteries across the country, people gather to remember the veterans interred there and to place holiday wreaths on their final resting places. The Webster Luke Air Force Base “GorLukes” (a play on the University's mascot, the Gorlok) participated in a ceremony honoring the fallen from all branches of the military and then joined in the placement of nearly 6,000 holiday wreaths. Along with Unternaehrer, the "GorLuke" holiday wreath crew included campus director David Handrahan, and students Steve Olson, Heather Parker, Ricky Radford, Mark Spina, Feann Stephens, Jermaine Taylor, Bruce Thompson and Brittney Weber, all of whom are veterans. With almost 60,000 graves in the cemetery, not all were able to be covered, but each year through donations, the number of wreaths grows. One member of the Luke crew was even able to honor the memory of his former commanding officer, who is buried at the site with a wreath. Left: Corporate sponsors, in this case Wal-Mart, donate the transportation to bring wreath across the U.S. from the Worcester Wreath Company in Maine to all of the National Cemeteries. Right: The "GorLukes"
The "GorLuke" volunteer crew included campus director David Handrahan, professor Pam Unternaehrer and students Steve Olson, Heather Parker, Ricky Radford, Mark Spina, Feann Stephens, Jermaine Taylor, Bruce Thompson and Brittney Weber. "Since this is a campus on a military base, we often take part in military related projects," said Handrahan. "Our Webster Works Worldwide event was helping children of deployed military members learn what their parents do when deployed for long periods of time to help them cope with the separation. We also place flags at each grave at the National Cemetery for Memorial Day." The "GorLukes" efforts don’t exclude non-military students; they and even local alumni take an active role to learn more about what the military does and the culture of the their fellow students. “Two local alumni who were graduates from the College of Fine Arts took part in our Webster Works Worldwide thanks to the Webster Alumni network and they were so appreciative of not only getting to link up with the local Webster campus, they said they learned so much about the military and were even treated to a tour of Luke AFB afterward including a visit to a fighter jet display," said Handrahan. Wreaths Across America began several years ago when the owner of the Worcester Wreath Company in Maine, Merrill Worcester, had overproduced that year’s holiday wreaths for sale. He remembered that as young boy, he had visited Arlington National Cemetery near Washington, D.C., and he thought that placing wreaths on some of the graves would be better than throwing them away. After getting permission to do so, he drove a truck full of wreaths to Arlington and joined by some friends they began what became an annual rite of placing the holiday wreaths, which has now spread across the country to every national cemetery.